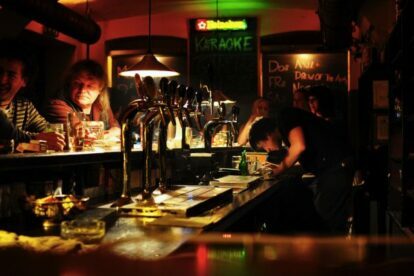 Tucked away in Hernals, one of the classic former working-class quarters of the city, there is a Lokal called Das Jetzt. Like a diamond in the rough, it has that magical quality of being simultaneously out of the public conscience while developing a cult reputation as one of Vienna’s best places to go if you want to enjoy excellent beer with quality, cheap pub snacks. The intimate atmosphere and inviting ambience encourage camaraderie, which, in my eyes, rivals most pubs in Vienna. On the one hand it’s an ideal place to go if you want to talk and enjoy a good beer, possibly one of the excellent value Fladenbrots on offer – a contemporary twist on the ubiquitous Beisl toast. Additionally, a recent extension into the neighbouring paint shop has managed to enhance the pub by providing more space and the option to turn into the old bar for music and table football, or the more relaxed newer section where you can sit with friends and talk the night away. Das Jetzt isn’t all about chatting, though: it’s also a haven for lovers of niche music, with regular DJ slots. The pub’s beer garden really sets it apart from other places, a wide Hof with a bar and a pagoda, and grills to rent out in the summer. Oh, and by the way, they play every single St. Pauli game. That might tell you something about the politics.